5124 ∆ 52HAN 100 Centimes on 80 Pfg. 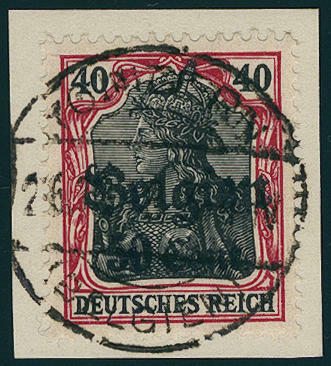 Germania from right margin with house order number \"H6557\", wonderful fresh colors in perfect condition on magnificent white letter piece with perfect neat postmark \"BEIRUT German post 31.3.10\". Used house order numbers are general rare. A so nice copy of the top value counts to the rarities of this area. By Michel catalogue due to missing offers only noted without price! Photo expertize \"faultless condition\" Jäschke-Lantelme BPP. 5556 ∆ 11FI 1 F. 25 C. On 1 Mk. 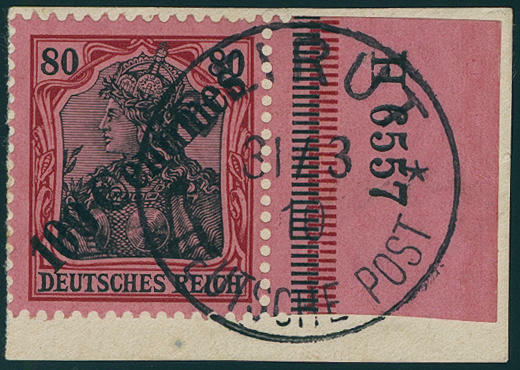 Carmine red, right upper corner of the sheet with scarce overprint plate flaw \"left star on two tips standing\", which only in a part of issue occurs, on magnificent letter piece, all perfect and on self-formed pages \"post monitoring place 33 b 8.9.17. \". An exception copy for the highest standards! Photo expertize \"the condition is perfect\" Wasels BPP. 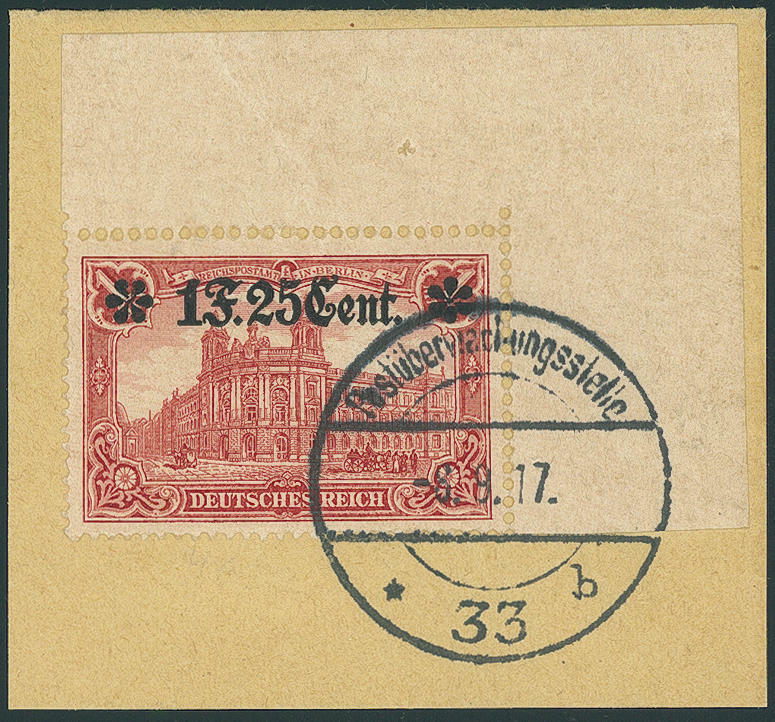 5557 12A 2 F. 50 C. On 2 Mk., 26:17 perforation holes, complete original sheet of 20 each values, corners straightened, with house order number \"H2800.17\" and plate number \"144\", here and there a little separated, in perfect condition mint never hinged very rare! 5558 01. Feb Postage stamps set 1918, fresh colors and in perfect condition mint never hinged, expertized Hey BPP. 5560 ∆ 6Ba 50 Pfg. 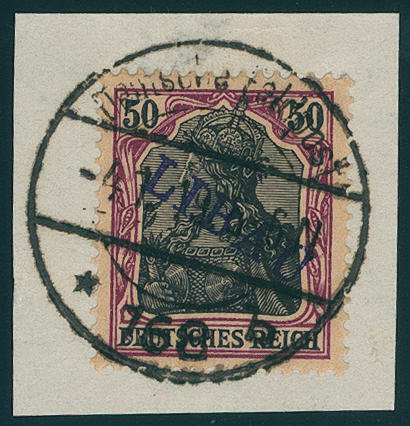 Germania, violet blue overprint \"LIBAU\", type II, fresh colors and very well perforated on beautiful white letter piece, perfect centric and neat cancelled \"German army postal service 168 b 4.1.19\", for the highest standards, expertized Schlegel BPP. 5551 01. Sep Postage stamps set 1914, all nine values, fresh colors and very well perforated, in perfect condition mint never hinged in perfect condition, in this quality rare! 5552 ✉ 1HAN 3 Cts. 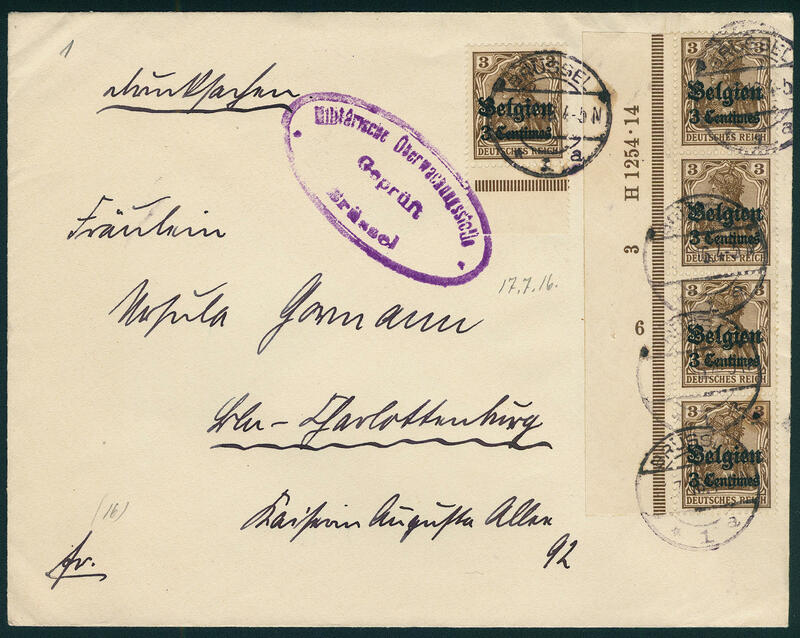 On 3 Pfg., vertical strip of four from left margin of sheet with complete house order number \"H1254.14\" and additional further plate numbers, as well a further lower margin copy as correctly franked multiple franking on nice printed matter with censorship stamp \"Military supervision place expertized DRÜSSEL\" to Berlin-Charlottenburg. Very rare! 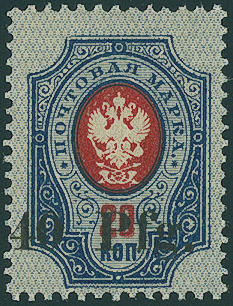 5553 ∆ 20bI 50 C. On 40 Pfg., the scarce overprint type I, fresh colors and in perfect condition on very nice white letter piece perfect centric cancellation, expertized Hey BPP. Michel 400,- €. 5554 23II 1 F. 25 cent. On 1 Mk. 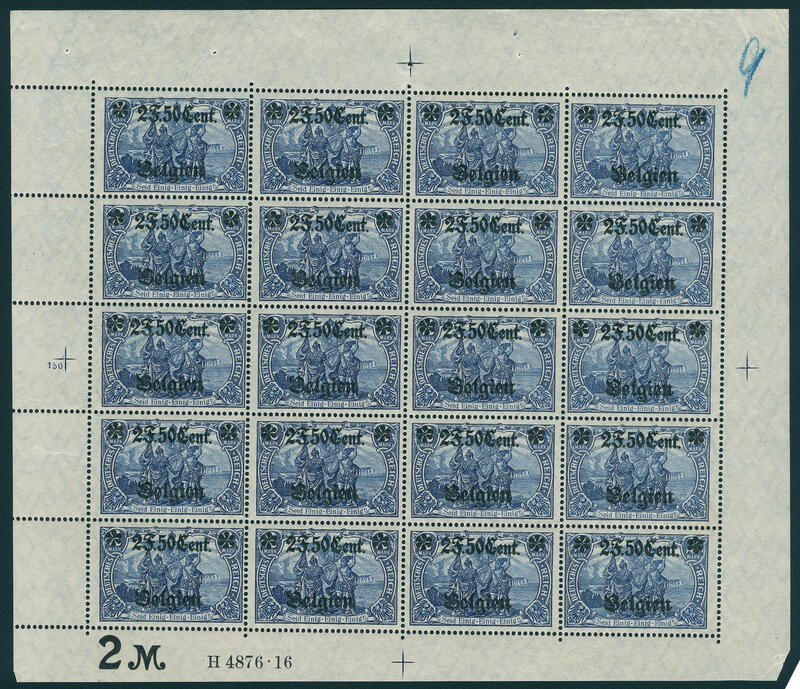 Peace printing, 25:17 perforation holes, indication of value in the Star line, complete original sheet of 20 each values with house order number \"H4875.16\", only in the margin of sheet faults, all stamps in perfect condition mint never hinged decorative and scarce unit! Michel for normal stamps 1000,- €. 5555 24IIA 2 F. 50 C. On 2 Mk. 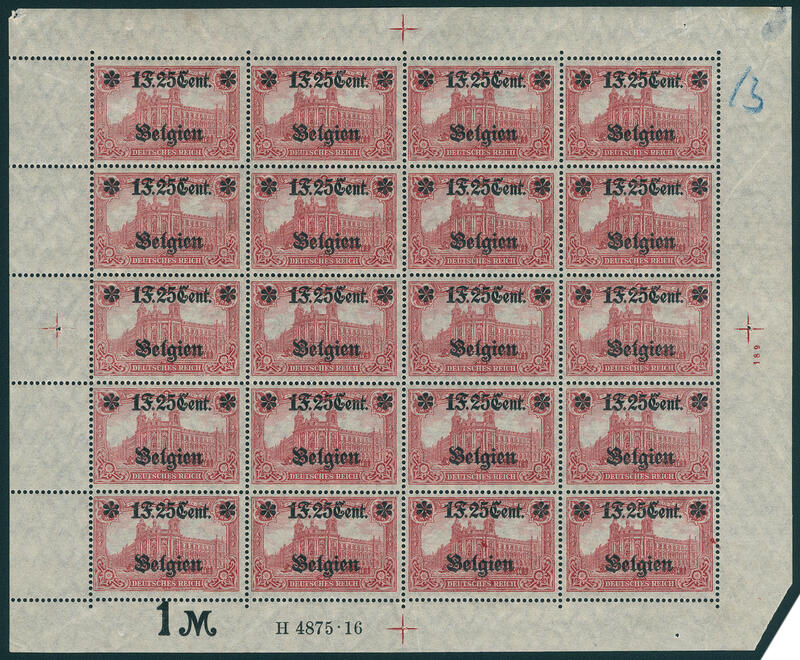 In type II, 26:17 perforation holes, complete original sheet of 20 each values with house order number \"H4876.16\" and plate number 150, unfolded, a value slight adherence trace, otherwise in perfect condition mint never hinged there are only still few original sheet have been preserved! 5559 4DD 40 Gr. On 3 Kop. Dark rose with double black overprint, wonderful fresh colors, large margins all around with full original gum and tenuous trace of a hinge. By Michel unknown and probable unique! Photo expertize Mikulski. 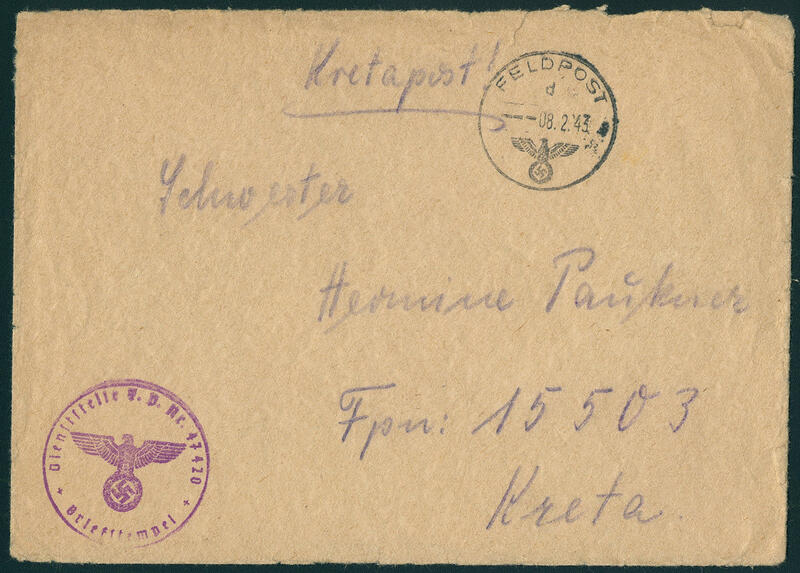 5811 ✉ North Africa, fieldpost letter with single circle postmark \"army postal service c 31.7.41. \", sender adress with fieldpost number 15840 (oases company 2). Use in the basis front in Libya respectively Sidi Azeiz and Sollum. An extraordinary cover with interesting text. Very scarce unit! 5812 ✉ Island post (forerunner), fieldpost letter \"CRETAPOST\" with sender adress fieldpost number 24283 (Crete) the Fort brigade Crete and letter cancel 4720 to the fieldpost number 15503 in Crete (battlefield hospital 220). Rare! 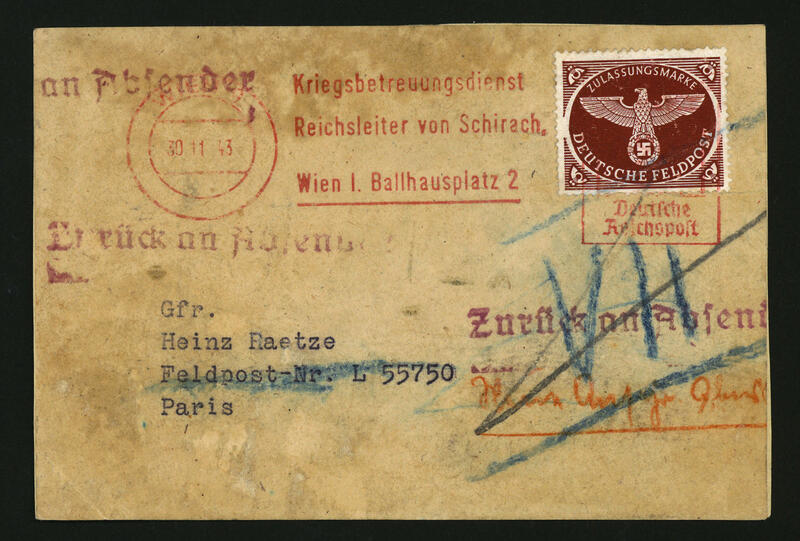 5781 ✉ 2A Field post parcel admission stamp perforated with senderÂ´s meter cancel \"Vienna; Empire leader from SCHIRACH 30.11.43\" to Paris and returned, sender adress was member from tank regiment Hermann Göring. 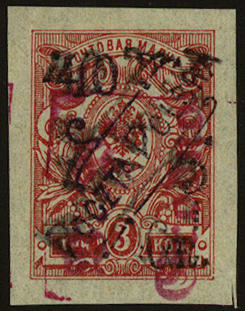 Extremely scarce combination between admission stamp and senderÂ´s meter cancel. Photo expertize Müller BPP. 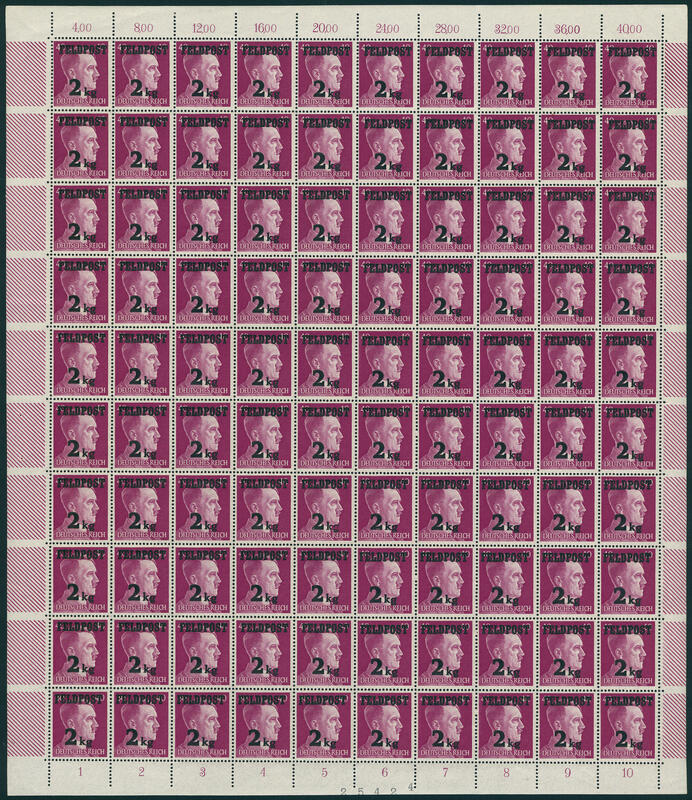 5782 ✉ 2A Army postal service admission stamp perforated with additional franking 20 Pfg. 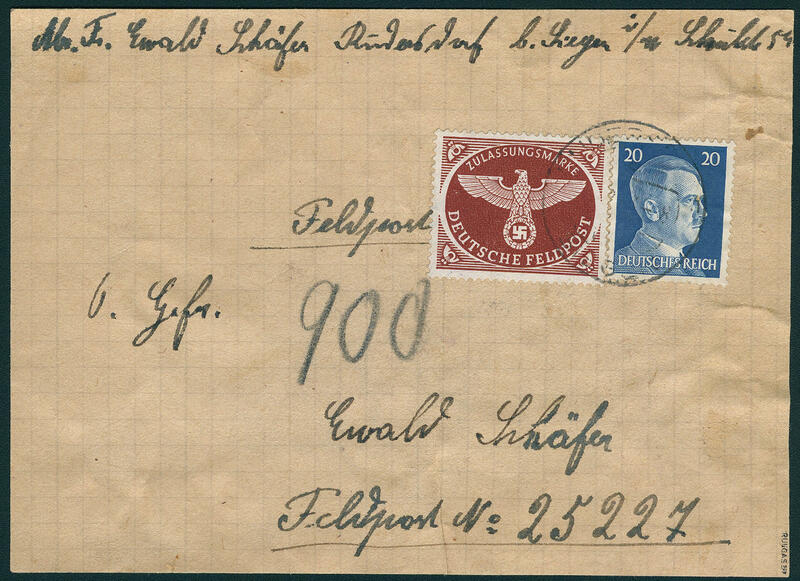 Hitler, in perfect condition on complete army postal service packet address from \"RUDERSDORF\" from the year 1943 to a member the Motor vehicle atelier company 9 with the fieldpost number 25227. These unit was in the Südabschnitt the eastern front inserted. Photo expertize Müller BPP. 5784 ✉ 3 2 Kg. Army postal service on 40 Pfg. Hitler in combination with 20 Pfg. 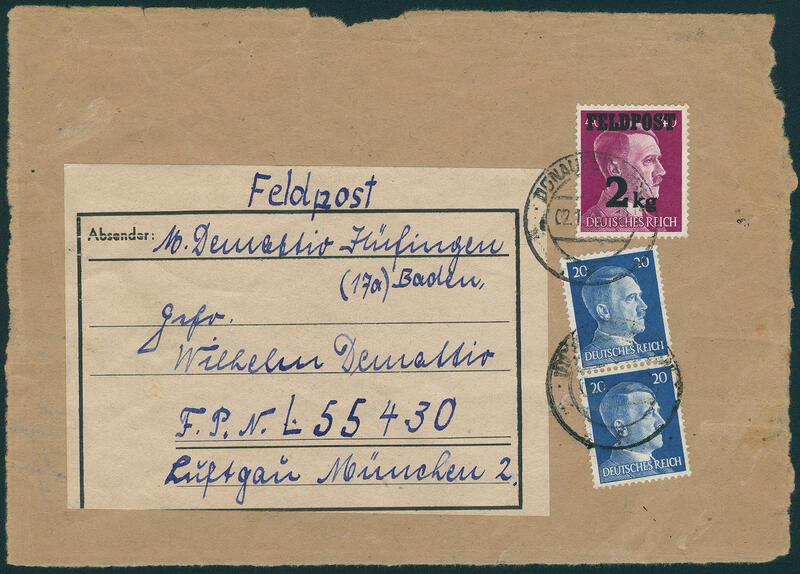 Hitler in the vertical pair on complete army postal service packet address from \"DONAUESCHINGEN 2.1.45. 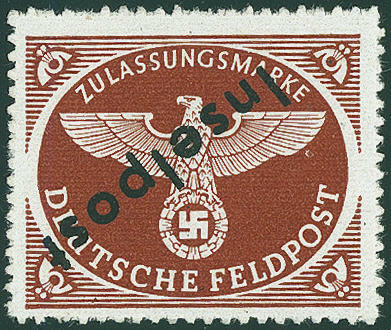 \" to the fieldpost number L55430. The consignee was member the 2. 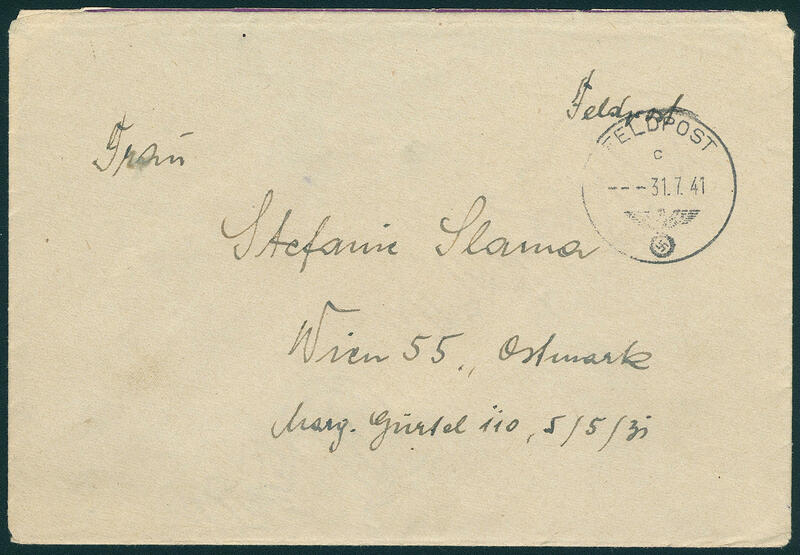 Battery the heavy flak battalion 459, the in Munich / South German inserted was, apart from a corner crease the admission stamp and the as usual slight traces of usage an extremely attractive copy this army postal service rarity! Photo expertize Gabisch BPP. Michel 7500,- €. 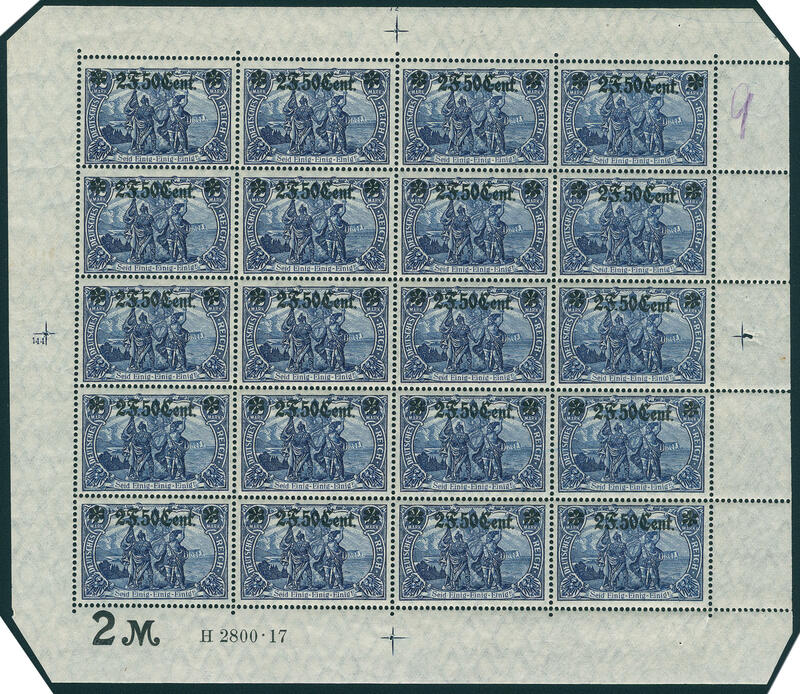 5785 5a Tunis small package stamp 1943 on thick paper, horizontal pair from left margin of sheet, wonderful fresh colors and in perfect condition mint never hinged, without any signs. An exception copy! Photo expertize Volz. 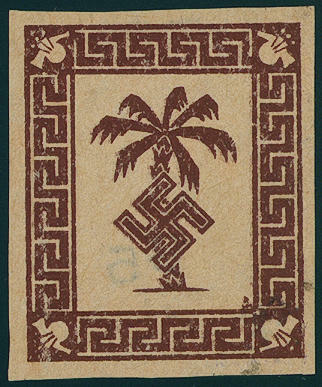 5786 5PU Tunis small package stamp 1943, proof on brownish, ungummed thin paper, unperforated, fresh colors and except for one dirt lower right in perfect condition. A rarity of this area with an edition from only 100 piece! Photo expertize Müller BPP. 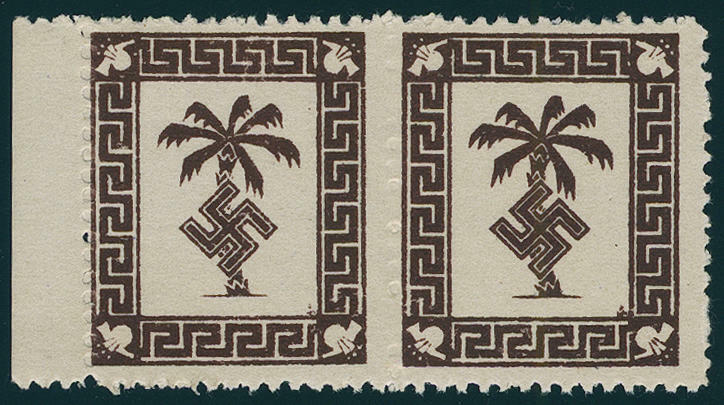 5787 6K Vukovar admission stamp 1944 with inverted overprint \"island post\", fresh colors with perfect roulette and in perfect condition mint never hinged an especially nice copy this island post rarity! Photo expertize Müller BPP.